Browser-based online game company InstantAction has gone out of business. 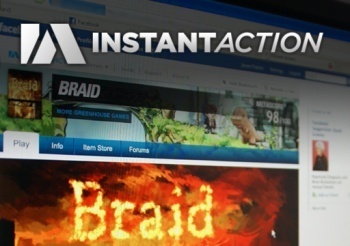 It was exciting news when InstantAction went live a little over three years ago with the promise of bringing "compelling original action games" to conventional web browsers. It worked pretty well, too, and InstantAction scored a big coup in March 2009 when it announced that it had picked up the rights to the online FPS Tribes. But that wasn't enough to keep the lights on and yesterday management revealed to employees and gamers alike that InstantAction and the Instant Jam Facebook game were going under. "Today, InstantAction informed employees that it will be winding down operations," manager Eric Priesz wrote in a short message. "While we are shutting down the InstantAction.com website and Instant Jam game, Torquepowered.com will continue to operate while InstantAction explores opportunities with potential buyers for Torque. We thank all of our past and current customers for their support." Torque is InstantAction's popular game engine, which has been licensed for use in titles including Rocketmen: Axis of Evil, Mass Effect Galaxy and many others. Former InstantAction Director of Operations Alex Reid told OregonLive.com that several of the company's employees had left in recent weeks as it became clear that the company could not survive, including Reid himself, who is now a lead developer and engineering manager at Rumblefish. Ultimately, he said, the company just could not come up with earn money from its products. In a bit of an interesting twist, InstantAction CEO Louis Castle said back in April that retailers like Wal-Mart and GameStop had "abused the industry horribly" with rentals and used game sales, and suggested that technologies like InstantAction would eventually help drive them all under. "We're not going to be the only technology out there, but every one of them will be another brick in the wall, another step in the right direction to saving our industry from partners that became parasites," he said.